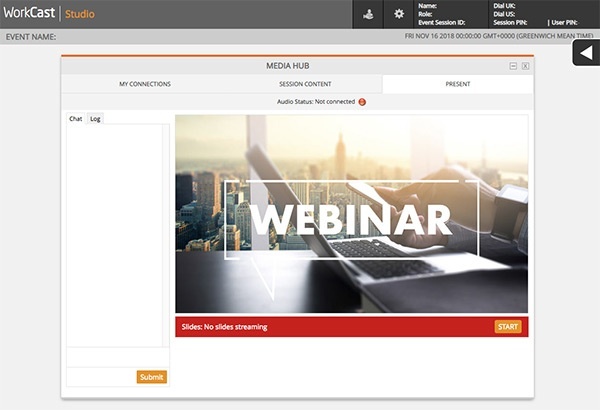 Users with a Present+, Producer+ or Enterprise licence can easily moderate and answer any questions asked by webinar attendees providing questions are enabled within your event. To ensure your event has 'Ask a Question' available within your event template firstly navigate to your event ensuring your are in the 'Event Experience' tab and 'Extras' ensuring the 'Include Ask a Question' option is selected, with any changes saved and published to take effect. Firstly navigate to the WorkCast Studio by clicking 'Present Now' whilst in your created event. 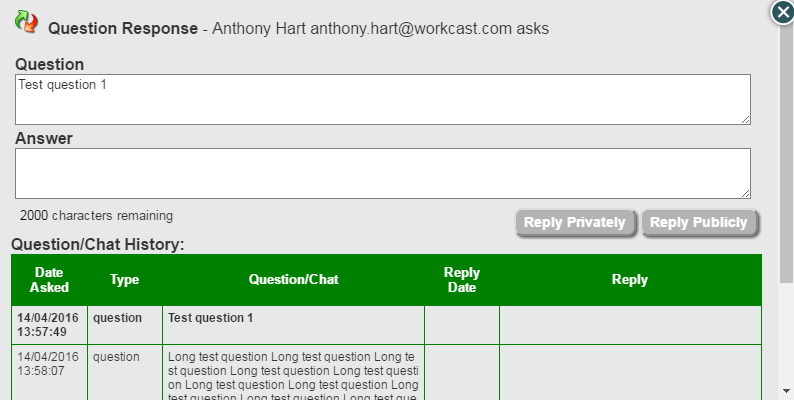 Alternatively a direct login can be created to the WorkCast Studio for a single event. This will allow a user to moderate the attendee questions received from an event without having full access to your WorkCast account. Once logged in you will see a number of pods available to run your event, some will be placed within the white arrow tab in the right hand side menu. You will need to ensure you have the 'Attendee Questions' pod open. In order to make the most of your event experience you can tailor your view to include only those sections that are relevant to you. You can also re-size the width of the 'Attendee Questions' pod to suit your personal layout preferences. To remove a pod simply click on the on the relevant pod. This will move it to the pods menu on the right of the screen. Pods can be re-instated at any point by opening the pod menu on the right of the screen by clicking on the menu expand button. 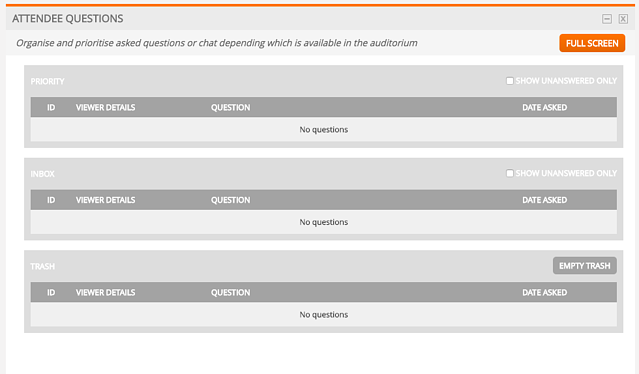 In order to monitor questions coming through the audience auditorium you will need to expand the attendee questions pod. All attendee questions will appear in this section, and from here you can track, answer, and manage your questions. All questions drop straight into the inbox section. There is a maximum of 100 questions that will appear in the Attendee Questions module - this is so your questions are easy to manage. There is no limit to how many can be asked though and any that don't show here will be available in the report after your event. To allow more questions through, delete those that you have answered or don't need. They will always appear on your reporting, they just won't show in the Attendee Questions module which in turn will allow more questions to filter through. At this point an attendee will be able to see their own questions only, so this is currently a private question. You can drag and drop questions in order to change the order they appear in. The items on the left are status and those on the right are action. STATUS - this shows the question has been replied to. If the question has been replied to then this arrow will turn green. It is possible to update this status manually mark a question as replied to if required, for example if it is answered verbally, and not through text. STATUS - this shows if a question has been made visible to all. This can be done when replying publicly option. It is also possible to update this status manually to show a question to all without replying. ACTION - this moves the question to the Trash section of the attendee questions. ACTION - this moves the question to the Priority section of the attendee questions. ACTION - this moves the question to the inbox section of the attendee questions. ACTION - this allows you to reply to the attendee. Clicking on this button will activate the Question Response pop up. In here you will be able to reply to the questions posted. When replying you will have the option to Reply Privately or Reply Publically. All previous questions and answers for that attendee are displayed in this pop up section allowing you to track the conversation. Once you have answered your question you will see your question has been updated to show that it has been actioned and is now showing as not highlighted. In order to sort your questions during a live session you are able to mark them as a priority. This moves them to the Priority section of the page so you can sort them before answering. Within Priority you have the same functionality as within the inbox including; Reply Privately, Reply Publically, Re-ordering, Mark as answered and Mark as public. Moving questions to Priority does not have any influence on the attendee view. In order to further sort your questions you can move any to the trash folder. This allows you to filter out non relevant questions, meaning you can focus on the important questions. Once a question is in the Trash it cannot be seen by the attendee and cannot be replied to. A question can be moved back to the Inbox or Priority from Trash using the relevant action button.